Yesterday while listening to Alan Alda discuss his Parkinson’s diagnosis and I remembered a miraculous story from a long long time ago. If you fact check this story I’m sure it’s loaded with inaccuracies but it’s a true story. 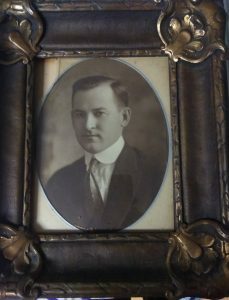 My grandfather, Dr. Jack Stell, was a surgeon in Hot Springs, Arkansas. He studied at Ouachita Baptist University and Tulane, then opened his practice here, between 1915 and 1920. As a surgeon at St. Josephs’ , he was loved, even adored by his nurses, who were all nuns at the time, because it was a Catholic hospital. As a Baptist in the early 1900s my grandfather was not a fan of the Catholic church and he did not approve of the Pope’s power or position. But he loved, respected and needed his nurse-nuns. During the early 1940s something started happening. Many of the local surgeons were enlisted during WWII and working to put soldiers back together elsewhere. So, there something of a shortage of surgeons in Hot Springs. Daddy Jack (the grandkids name for him) was extremely busy. He and his habit clad nurses worked almost constantly. But, Daddy Jack started noticing that something was wrong. Tiny tremors in his fingers then hand hands, began frustrating him. At first, no one noticed. But he knew something was terribly wrong. After a year or so he was diagnosed with Parkinson’s . But Hot Springs and the hospital still desperately needed his surgical talents. When I was a little girl, in the 60’s, my mother, and ancient withered nuns, would tell me stories about my grandfather. Old nuns in dark heavy habits , would take me into their offices, give me ice cream or pudding from the hospital kitchen and tell me stories. The one repeated to me so many times was simple and beautiful. Daddy Jack told his nurses about the diagnosis. Together, they decided before each operation, they would all kneel, on the cold tile floor in the operating room, and they would pray, as one, for his hands to be steady and true. The Baptist doctor and Catholic nuns joined hands and asked for a miracle. God listened. For almost two years Dr. Jack Stell and his nuns prayed and continued with the life saving surgeries. Once Hot Springs was repopulated with a few more surgeons, Dr. Jack Stell retired to his home on Prospect avenue. As a little girl, I would eat my pudding, listening to the old nuns as they wiped their eyes with handkerchiefs they miraculously produced from their sleeves. Today, I understand the power of their faith, love and conviction. Back then, I only knew I had to sit and listen to their stories in order to get any goodies.